Clearly distinguish hazardous material shipping papers from others by tabbing them or keeping them on top of the stack of papers. When you are behind the wheel, keep shipping papers within your reach (with your seat belt on) or in a pouch on the driver�s door. They must be easily seen by someone entering the cab. 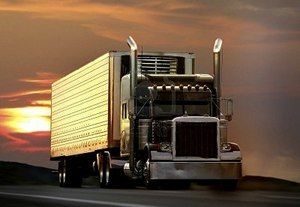 When not behind the wheel, leave shipping papers in the driver�s door pouch or on the driver�s seat. Names and telephone numbers of people to contact (including carrier agents or shippers). Nature of the explosives transported. Precautions to take in emergencies such as fires, accidents, or leaks. Copy of FMCSR, Part 397. A driver transporting chlorine in cargo tanks must have an approved gas mask in the vehicle. The driver also must have an emergency kit for controlling leaks in dome cover plate fittings on the cargo tank. A placarded vehicle, or one that has cargo tanks used for hazmat, must do what at a railroad crossing? You must stop 15 to 50 feet before the nearest rail. Proceed only when you are sure no train is coming. Do not shift gears while crossing the tracks. The Department of Transportation has an Emergency Response Guidebook for firefighters, police and industry workers on how to protect themselves and the public from hazardous materials. The guide is indexed by proper shipping name and hazardous materials identification number. Emergency personnel can obtain these things from the shipping paper. That is why it is vital that the proper ID number, shipping name, label and placards are correct. When you discover a fire, send someone for help. You may use the fire extinguisher to keep minor truck fires from spreading to cargo before firefighters arrive. Feel trailer doors to see if they are hot before opening them. If hot, you may have a cargo fire and should not open the doors. Opening doors lets air in and may make the fire flare up. Without air, many fires only smolder until firemen arrive, doing less damage. If your cargo is already on fire, it is not safe to fight the fire. Keep the shipping papers with you to give to emergency personnel as soon as they arrive. Warn other people of the danger and keep them away. You might have to control minor truck fires on the road. However, unless you have the training and equipment to do so safely, do not fight hazardous material fires. Dealing with hazardous material fires requires special training and protective gear.